A claim on a province is an assertion that that province should be part of a nation, and can be gained in several ways. Claims exist in two versions: permanent and temporary. Any claim held by a nation or its subjects allows a conquest casus belli towards the current owner of the province. A claim disappears when the claiming nation becomes the owner, when the claim runs out or when the claiming nation ceases to exist (this includes subject integration/annexation). A temporary claim is a type of claim which can be acquired through the fabricate claim covert action, events, and missions. A temporary claim will disappear after 25 years if the claimed province is not owned by the claimant country (note that the claim retains its original expiry date, thus disappearing immediately if it has expired and the claimant country no longer owns the province). If the claimant country is at war with the province owner at the original expiry date, the claim will not expire until the end of the war. Downsides to temporary claims are few. Aside from using up a diplomat for a time and potentially delaying a useful war, countries do not appreciate another force making claims of right to their land. While this generally has no in-game effect, it does cause tensions and reduce relations if the target country is an ally or subject. Additionally, there are rare events associated with claims that can cause further complications, particularly again with claims upon allies. The events are infrequent enough to be safely ignored, but it's important to know that they can occur. A spy network can be used to fabricate a claim on a neighboring province or a province across a single sea zone as long as the claimant nation and the owner of the target province are at peace with each other. A nation which has completed Exploration ideas may also fabricate claims in colonial regions, even without bordering that province. Likewise, a nation which has completed Expansion ideas can fabricate claims on provinces in trade company regions. 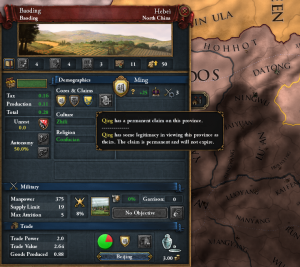 The Transfer Subject age ability during the Age of Exploration allows fabricating claims on provinces that border existing claims (requires Mandate of Heaven). A permanent claim is a special type of claim which can be granted by nation formation decisions, certain national events, and the mission system. A permanent claim will never expire, and can only be revoked through war or events. Having claims (either permanent or temporary) on a province can reduce the aggressive expansion generated by taking the province if the correct casus belli was used to declare the war. Under the conquest casus belli, only the target province of the war will gain an aggressive expansion reduction. Having a claim lowers the claiming nation's opinion of the nation that owns the province with a claim on it by -10. This is a set value, and does not multiply with more claims. Since some diplomatic agreements require that the player's nation's opinion of the target be some positive number, compare the benefit of the potential agreement (typically an alliance) against the benefit of holding the claim on long term strategy and consider foregoing or delaying extraneous claims or letting existing claims lapse. Claims are useful in almost any conflict, and cost very little, so are an important part of making the most of a situation. They are useful when a war is ending both in attacking and in defending, but have no effect during the actual conflict. Temporary claims are far more common than permanent ones, as they can be created at will. The AI will also make frequent use of claims. Since temporary claims cannot be created while the country is at war with the target, they are generally created as a prelude to such a war. The benefits offered are strong enough that delaying the war to get them can often make sense. If the player has diplomats that aren't doing other things, it can often be useful to create temporary claims on nearby neighbors even if there is no intention to attack them. Since the world can change somewhat quickly, a friendly neighbor today can become an enemy or target tomorrow. Similarly, if the player is fearful of a nearby neighbor and never wants a war, claims may still be a good idea as there may be war regardless and if the player manages to win it the claims will come in handy. Choosing whether to create claims on an ally or potential ally is more tricky. Since there is a relations penalty and negative events associated with an ally that is claimed upon, it can often be good to avoid claiming. As the ally is not usually an intended target, the claims do not serve much positive function. However, situations can change, and if the ally is suddenly no longer an ally (such as if they are also allied to a war target and choose to join them instead of the player), the claims might well be useful after all. When forcing vassalization, the new subject may still have the player's claims upon them, giving a small relations penalty. This penalty will be removed when the claim expires, 25 years after its creation if not sooner by choice or event. Since this penalty is only in relations and the relation improvement cap for subjects is doubled, the penalty often does not cause much trouble. If the player chooses to take the new vassal's land as part of the war negotiation in order to avoid this penalty, this will often backfire, as the trust lost by taking land is a larger concern than the relations penalty for keeping it as a claim. There is generally no reason to fabricate new claims upon a subject unless it is known that that country will lose its subject status in some fashion. If the player has multiple claims upon a target and the Conquest CB is to be used to start a war, he or she must choose which claim is being used as the war goal. Achieving the war goal grants a ticking warscore. There are two possibly competing factors in this choice. If the player chooses an easy target to take (nearby and unprotected by fortifications), the war goal is easier to achieve and thus the ticking warscore can start in the player's favor earlier. When the war is over, however, the province chosen has a lower warscore cost. As such, it may be preferable to choose the higher-value target, especially if one does not wish to take all claims. When you have AI subjects bordering your enemy and your main goal is to take land away from your enemy, then be sure to check for claims held by subjects and transfer the occupation to them before entering peace negotiations. Provinces can only be transfered to the current occupant. Likewise, when you and your AI ally enter war while both having a claim on a province, then be sure to start occupying it first, otherwise it will be impossible to demand it in a peace deal. Permanent claims give more bonuses than temporary ones and cannot be manufactured. The improvements are substantial, and these claims should have weight in the player's plans. When the player joins the war of an allied AI nation, that AI nation is more willing to grant a province to the player when they have a claim on a province of the enemy.